17 Comments This post may contain paid and/or affiliate links. Please see our disclosure policy for further information. 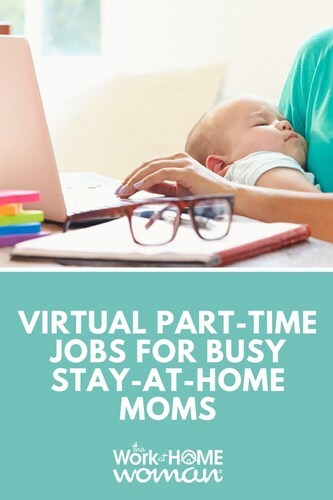 If you have a newborn or toddlers running around the house here are some virtual part-time jobs that will allow you to work from home around your kid's schedule. Teaching ESL classes is a great way to put your language skills to use! English majors, certified TEFL and TESOL instructors and those with teaching experience are perfect for the position. ESL classes are even pre-recorded from time-to-time and student interactions are handled virtually on your own schedule. Do you have the gift of gab? If you’re comfortable on the phone you could find positions in sales, customer service, travel, and reservations. Many excellent companies outsource their phone positions to virtual, part-time employees. There are many types of online work, but Search Engine Evaluators specifically complete internet research tasks to evaluate if search results are relevant and useful. These jobs can be done 100 percent online and offer flexible scheduling. For more website testing gigs, check out this post! If none of the above roles fit your experience and preference, don’t worry—there are plenty of interesting jobs for part-time telecommuters and virtual workers. Roles range from planning travel to internet research, bookkeeping, and more. View the many part-time options available at FlexJobs. This page includes some affiliate links. Please be aware that we only promote advertising from companies that we feel we can legitimately recommend to our readers. Please see our disclosure policy for further information. I am a retired real estate agent in SE Wisconsin……would there be a suitable job in real estate, title companies, mortgage company type jobs? Hello I’m very interested in a stay at home job. I’m a retired photographer and would love to look at the job with Shutterstock / Shutterstock Illustration Reviewer but the link doesn’t work. Would you please check it and get back to me? Good luck and let me know how it works out for you! We have great opportunities for Moms at Hulafrog! I also suggest creating a plan and taking action steps each day. I’m a mom with a newborn baby and toddler. Can I try to work at home or just a part-time job? Thank you! Yes, you can work-at-home in a part-time position. Working for VIPKID is amazing! I love it so much! If anyone has questions about the company, please let me know! That’s great that you’ve had a good experience with VIPKID! Any insight on how to apply to be accepted? For VIPKid you’ll need a Bachelor’s degree (any field) and some sort of teaching/mentoring/tutoring/coaching experience. Just fill out the online application. I’m totally going to apply for VIPKID once I graduate from college. That’s the only thing stopping me at the moment. I hear such great things about that company! Good luck, Alexis! I’ve heard great things about them as well.